We've barely seen anything from Rockman Xover, the new social RPG for iOS devices, but there's already a nice piece of fan art online. This is Hoketsu's interpretation of the game's hero, "Xover Rockman." 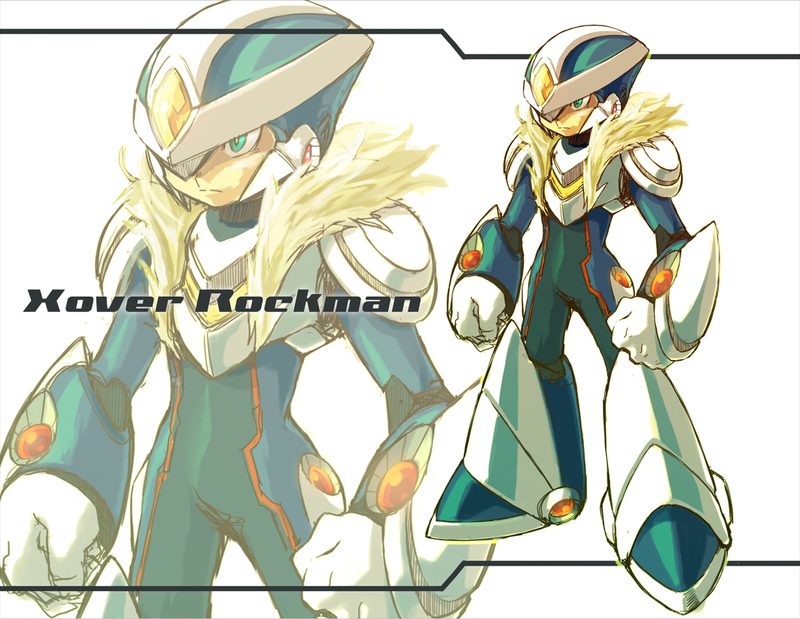 Capcom hasn't revealed the character's official name just yet, but you've got to admit "Xover Rockman" has a nice ring to it. Enough about the name; what do you think of the character? Sure, the design is a bit different from what we're used to, but hasn't that always been the case? There's bound to be a healthy amount of disagreement whenever a new Rockman is unveiled. It happens. Check out more of Hoketsu's fantastic Rockman-inspired artworks at his Pixiv here. Not big on the parka. Still hoping that's some kind of customized look. The awfulness of what we've seen of this game so far is laughable. Relating to the fanart; I'm a too focused on the helmet being elongated to worry the possible accuracy of the piece. I'm sure his appearance will be customizable. But Overman, as he's being promoted right now? I'll be honest. I think the design looks more like Pluto themed Noise Change than anything. But I'm not totally against it or it's design concepts. I'm amenable to the idea of there being a "Rock"man mock up like a Glam Rocker. So I don't mind the singlet design. I don't mind the fur. But I don't think that's enough of an outline gets him there. I don't know if anyone else thinks so, but I think the design is very Lost Planet inspired. At least, that's how I feel when I look at it. I don't like it. It looks too much like an armor for X to be it's own character. *Sigh* It seems Capcom doesn't give a whit for quality in their games anymore. I think the only cool thing about this game is the new Rockman. The fur is an odd choice and seems to go against normal design conventions, but it flows well. My only complaint is the helmet. It looked better in the official art, but seeing it here from a different angle makes it look kinda meh. reminds me of casshern a lil bit. Aww, and I was hoping I'd make Xover Rockman's fanart first. Boohoo. Nevertheless, awesome job, though I have to say, that helmet is a little too elongated. Maybe if it was reduced to the normal circular type helmet of X and Rock, I'd have no qualms. Other than that, I love the art! The fur, though unconventional, looks good on him. And I love the BN/SF touch on the leg portion of Xover Rockman (can we just name him Exover (pronounced Eksover) 'cause it's kinda weird calling him Xover Rockman). Well, now that I look at it, maybe a slightly narrower face would be better? Don't get me wrong; I love seeing this kind of stuff. But maybe a slightly narrower face would've been better. Shouldn't really call it "fan" art. That would imply the existence of fans. I think the design looks fine. For me, how the character actually plays would make or break him. If he plays well, I'd probably enjoy how he looks even more. The opposite follows. I gotta hand it to him: that looks great. Even with the collar ruffles. Nice color scheme, sleek new aesthetic. Still looks like one of X's armors, but then so did Axl at first. But really, this is X. Just hasn't been given a proper (re)name yet. I noticed this in the official art as well, but the design screams "Gate". And as someone who actually liked X6, that is a good thing. Quite a shame that the game itself is such a disappointing choice of hardware (and likely game engine, knowing how bad the MMX port was). The artwork looks cool, if nothing else. I don't understand how they think this could be a good design. I shall call him feather boa Rockman. That's some really nice fanart. Lots of people don't like the fur, but personally, I think it's a nice touch. It makes him more unique! On the topic of Xover, I really hope this game isn't automatic, (minus the shooting/jumping) since there isn't any d-pad in the screenshots. I really feel he needs some kind of belt piece. Doesn't have to be underwear-shaped armor like usual, but we already went over this with the Legends redesigns; without something to grab attention around the waist area it just draws attention to places it shouldnt. Star Force and Battle Network didn't have much of an issue because they were like that from the beginning, but this is using a pre-established look with an alteration. It really feels like something's missing. Not crazy about the fur either. You know how Zero has a REALLY LONG BLONDE WIG STRAPPED BEHIND HIS SKULL IN A PONYTAIL FASHION? You know how some people think Zero's fake hair is actually the source of his power?. Now, look at that Xover Rockman over there. This game is going to be a hit and fans will love it! I hate to admit it, but he's pretty cool looking. I hate the color, though. I wish he were more blue. Still, it's not bad. You can see bits and pieces of each RockMan/MegaMan in him. He has a Navi body, robot and/or Reploid feet, Shooting Star MegaMan's breastplate, a hybrid X and Shooting Star helmet, etc. It's nice. I'll give it that. But I still probably won't play this game. I don't own a mobile device anyway. He looks less silly than MMZ Zero. Not a fan of the fur. Otherwise... s'alright. Like a lot of other folks it seems, I'm not too hot on the neck piece. It may not be hair, though. I wouldn't mind if it were something like X's vapor trails in Command Mission. Then again, it's not like none of the other characters in the series have hair. Other than that, he seems to take after the X series the most. I wonder how customizable the character will be?